Subject to correction, the product was first added on 2019-02-11 14:09:24 and the last date we have for this product is 2019-02-11 14:09:24, where the last unit was sold for R 4765, which may have been a final clearance price. Huawei P Smart Blue 5.65" FHD (2160*1080), Kirin 659 16nm Octa core, 2.36GHz*4 1.7GHz*4, 3GB RAM / 32GB ROM, LTE Dual SIM, Nano SIM, Android 8.0 Oreo, EMUI 8.0, Front 8MP F2.0, Rear 13MP 2MP Dual Camera , Bluetooth 4.1, 802.11 b/g/n, 2.4G BT4.2, USB 2.0 USB 2.0 NFC, GPS, AGPS, Glonass, Mini USB charger, Fingerprint sensor, Gravity sensor, Proximity sensor, Ambient light sensor, Gyroscope, Compass, battery 3000mAh, 150,1mmx 72,2mmx 7.5mm, Weight (grams) 146g (Only one Phone) Copyright © 2019 ComXpert International CC - COPYING IS ONLY ALLOWED FOR THE PURPOSE OF SENDING US ENQUIRIES. E&OE. 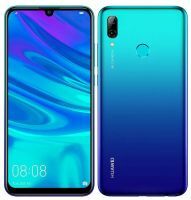 The best price and guaranteed service and backup from official computer suppliers in South Africa for the Huawei P Smart 2019 Blue (Dual SIM) Huawei P Smart Blue 5.65" FHD Kirin 659 16nm Octa core 2.36GHz*4 1.7GHz*4 32GB LTE Dual Nano SIM Android 8.0 EMUI 8.0 Smart Phone. Find related Huawei P Smart 2019 Blue (Dual SIM) Huawei P Smart Blue 5.65" FHD Kirin 659 16nm Octa core 2.36GHz*4 1.7GHz*4 32GB LTE Dual Nano SIM Android 8.0 EMUI 8.0 Smart Phone products in our Smart Phones Category for even more options. Read reviews and find out about Huawei P Smart 2019 Blue (Dual SIM) Huawei P Smart Blue 5.65" FHD Kirin 659 16nm Octa core 2.36GHz*4 1.7GHz*4 32GB LTE Dual Nano SIM Android 8.0 EMUI 8.0 Smart Phone. Discounts, specials and cheap prices only at ComX Computers.